In 2017 Stuart and Lea relocated and measured 19 individuals of the 381 seedlings originally found. These plants had 1-4 leaves; the longest leaf was 32 cm. It should be interesting to see which individuals are hanging on! 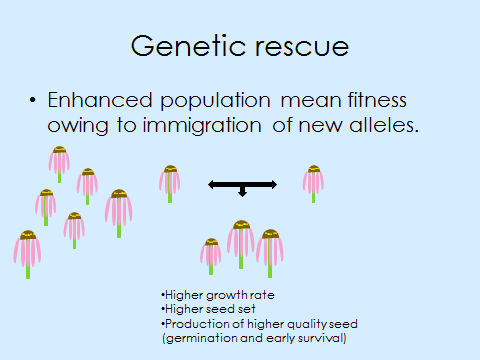 Caroline Ridley established this experiment to compare fitness (recruitment and survival) of seeds originating from individuals with parents from three different backgrounds: 1. both from a large remnant population, 2. both from a small remnant population (not rescued), and 3. one from a large population and one from a small population (genetically rescued). Caroline sowed achenes in an experimental plot at Hegg Lake WMA and marked seedlings with colored toothpicks in May 2009. You can find more information about Ridley’s next generation rescue and links to previous flog posts regarding this experiment at the background page for this experiment. We annually assess survival and fitness of these plants. In 2015 we relocated and measured 42 individuals of the 381 seedlings originally found. These plants had 1-3 leaves; the longest leaf was 21 cm. The dense non-native brome grass dominating this plot may be shading out these small plants. It should be interesting to see which individuals are hanging on! Read more about this experiment. Here’s a document that outlines a proposed visor form for the census of Caroline’s Next Generation Rescue experiment. Here are two spreadsheets with information to be made into visor forms. The first is a list of Echinacea positions we will measure from, in order to plant Stipa seeds. The relevant worksheet is the first one. In the visor form, I would like to be able to see row, position, Echinacea plant status and a column for notes. Breaking this list into multiple forms would be fine. The second is information for the “Next generation rescue” August seedling refind. I would like block, row, position and number of seedlings in May visible and would like number toothpicks, number toothpicks with no seedling, number new seedlings, longest leaf lengths and notes as editable fields. And finally, Stuart, could you check out some Stipa bunches in Staffenson and decide how close we could comfortably plant seeds next to the Echinacea in the garden?